Pieter-Dirk Uys was born in Cape Town in 1945 and has been in the theatre since the mid-1960s. Closely associated with both the Space Theatre in Cape Town and Johannesburg's Market Theatre during the 1970s and 1980s, he has written and performed 20 plays and over 30 revues and one-man shows throughout South Africa and abroad. His plays Paradise is Closing Down, Panorama, God's Forgotten, Auditioning Angels, Faces in the Wall and Just Like Home have been performed internationally, and his one-man shows Adapt or Dye, One Man One Volt, You ANC Nothing Yet, Truth Omissions, Live from Boerassic Park, Dekaffirnated, Foreign Aids, Evita for President, Elections & Erections, Desperate First Ladies and An Audience with Pieter-Dirk Uys have been presented in the United Kingdom, Denmark, Germany, Holland, Switzerland, Australia, the) USA and Canada. His performance of Foreign Aids at La Mama received the Obie Award in New York in 2004. Most of Uys’s satirical work was available in South Africa on video (and still is, on DVD) and so, in spite of government censorship during apartheid, he built up a very large multiracial audience. Members of the present democratic parliament remember seeing his videos while in exile and in prison! He has been seen on SABC since the late 1970s in a variety of programmes, including An Uys up my Sleeve (1985); One Man One Volt, which was to be screened prior to the 1994 election, but was held back for ten months; You ANC Nothing Yet (1996); and The Great Comedy Trek (2004). The series Going Down Gorgeous, featuring Nowell Fine in a saga from 1976 to 2004, was screened towards the end of the last century. Foreign Aids has been broadcast for Aids Day (1 December), and in 2007 SABC2 presented Dinner with the President, a 13-part talk show hosted by Evita Bezuidenhout. Ten of Uys’s shows are currently available on DVD. A prolific writer in many genres, Uys’s novel Trekking to Teema was South Africa’s first internet book in 2000, before being published in tree-format. His second novel, Panorama, was published by Missing Ink in 2013. He has also written Evita Bezuidenhout’s biography, A Part Hate A Part Love, as well as a book based on his12-part 1994 MNET television series, Funigalore, in which Evita Bezuidenhout interviewed the new democratic government’s leaders, including Nelson Mandela. His (and Evita’s) cookbook, Evita’s Kossie Sikelela (2010), became a bestseller and was followed in 2012 by a second cookbook, Evita’s Bossie Sikelela. Uys has also written two memoirs, Elections and Erections (2003) Between the Devil and the Deep (2005), as well as the ‘autobiography’ of Evita’s younger sister, Bambi Kellermann, Never too Naked (2011). Pieter-Dirk Uys was awarded South Africa's prestigious Truth and Reconciliation Award in 2001. He has received honorary degrees from Rhodes University (D.Litt.Hon. 1997), the University of Cape Town (D.Litt.Hon. 2003), the University of the Western Cape (D.Edu.Hon. 2003), the University of the Witwatersrand (D.Litt.Hon. 2004) and University of Kwazulu Natal (Doctor of Literature honoris causa 2014). As well, Pieter-Dirk Uys's celebrated alter-ego, Evita Bezuidenhout, proudly received the Living Legacy 2000 Award in San Diego, USA. In 2011 Uys was honoured with a lifetime achievement Teddy award at the Berlin International Film Festival; in 2012 he received both the FW de Klerk Goodwill Award and the German-Africa Award; and in 2016 received the ACT (Arts & Culture Trust) Theatre Lifetime Achievement Award. Recent successes include F.A.K. Songs and Other Struggle Anthems (2010), a cabaret revue featuring Bambi Kellermann with her Bokkie Band, and 50 Shades of Bambi (2013), both for the Fugard Theatre, Cape Town; extended seasons of Adapt or Fly (2012), An Audience with Pieter-Dirk EISH! (2013), The Echo of a Noise (2016) and Evita Bezuidenhout and the Kaktus of Separate Development (2017) in Durban, Johannesburg and Cape Town; and a two-week run of An Audience with Pieter-Dirk Uys at London’s Soho Theatre in 2014. In 2009, Uys directed Macbeki, his first new play since 2003, at the Market Theatre, Johannesburg. His next play, The Merry Wives of Zuma, was premiered in 2012, and his most recent play, African Times, in 2015. In 2015, Pieter-Dirk Uys turned 70. To celebrate, a new collection of his Afrikaans plays, Stukke Teater, was published by Human & Rousseau, and he was chosen as the National Arts Festival’s first Arts Icon. Uys performed three special solo shows during the 2015 festival: A Part Hate A Part Love (featuring Evita Bezuidenhout); Never Too Naked (featuring Bambi Kellermann); and The Echo of a Noise. In honour of Evita Bezuidenhout’s 80th birthday, Kyknet presented a birthday special, Kyknet vir Tannie, produced by Evita’s former secretary, Bokkie Bam (Lizz Meiring), with greetings from Evita’s far-flung family, and interviews hosted by Coenie de Villiers. Uys is the subject of two award-winning documentaries. The first, Darling! 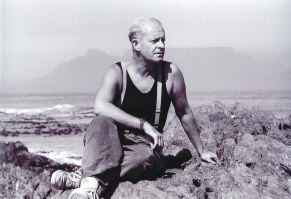 The Pieter-Dirk Uys Story (2007) (https://pdudarlingmovie.wordpress.com/), directed by New Zealander Julian Shaw, is about Uys’s Aids-awareness presentations. The second, Nobody’s Died Laughing: A Journey with Pieter-Dirk Uys (2016), directed by Willem Oelofsen, follows the peripatetic Uys for most of 2015. Both DVDs, as well as a wide range of Pieter-Dirk Uys’s books, plays and other DVDs, are sold in Evita’s A and C at the Perron. Evita se Perron, Pieter-Dirk Uys’s cabaret theatre and restaurant in Darling, where he lives, celebrates its 22nd year in 2018. The venue, which Uys converted from the old Darling railway station, is famous for its satirical garden, Boerassic Park, and is the domain of Evita Bezuidenhout, the 'most famous white woman in South Africa'. The unique museum/nauseum of apartheid artifacts there, reflecting the madness of the past, is arguably the only satirical exhibition of South Africa’s recent past. The Evita se Perron channel on YouTube (https://www.youtube.com/user/EvitaSePerron) hosts Evita’s Free Speech, a weekly feature on the state of the nation and the world.